Another 10 years is approximately how long sustainable forestry will be able to satisfy the continuously growing demand for wood. In Germany and Europe, new concepts are therefore being discussed for more responsible and efficient industrial use of wood, but resources are still limited. Researchers at the Technical University of Munich (TUM) are using data from a European research project to analyze the potential efficiency of multiple use between harvesting and combustion of wood. A cascading system composed of many suppliers, manufacturers and users is complex and costly. The material flows within and between the cascade steps are numerous and interwoven. As a theory, the concept has been described for years and has also been scientifically proven to save fossil resources, reduce greenhouse gas emissions and increase value. But so far, a targeted examination of resource efficiency has not yet been performed. Since biologically generating wood differs fundamentally from producing synthetic raw materials, it is important to examine whether and to what extent cascading use of renewable raw materials pays off in terms of efficiency. 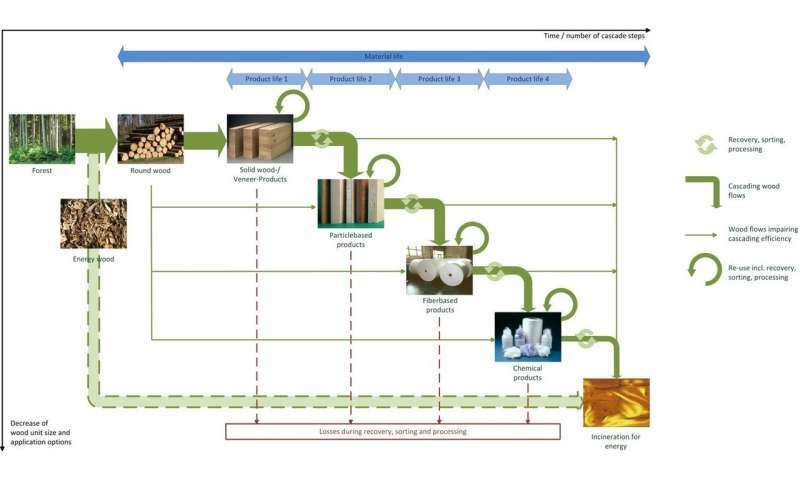 In order to account for the characteristic features of cascading use, wood researcher Michael Risse applied the holistic life cycle approach and analyzed the exergy of all materials used, the internal recycling processes and the consumption of other primary resources such as the forest land areas required. Exergy refers to the percentage of energy that can be converted into work. In two scenarios, the TUM researchers compared the path of one metric ton of scrap wood with the provision of the same functions using fresh wood. In the first scenario, the recovered wood was initially processed into lumber and then two subsequent times into chipboard in a cascading system. In the reference scenario, the same products were manufactured, but this time out of fresh wood. In real-world industrial use, cascading use is still in its infancy, as the necessary logistics processes and adapted process technology are not yet available. Furthermore, Professor Klaus Richter says, "Energetic utilization still has priority over the material use of wood." Almost half of the 60 million metric tons of forest timber harvested each year are used to generate energy, either directly or within industrial processes. The German Renewable Energy Sources Act (EEG) still encourages such usage until 2019, e.g. by subsidizing the generation of heat from wood energy with feed-in tariffs or by granting investment subsidies for heating installations such as wood pellet or wood chip heating systems. This one-sided incentive was criticized in the comprehensive climate protection report for agriculture and forestry conducted in 2016, to which employees of the Chair of Wood Science also contributed. Today, only a third of the recovered wood generated in Germany is being converted into chipboard; according to Richter, approximately 7 million metric tons end up being burned directly in order to generate heat and electricity in power plants. For the wood scientist, this is at least one step too few. He and his team of researchers advocate a more intensive material use of wood: "Over the mid-term, we need to utilize wood more efficiently, i.e. multiple times as a material, before we burn or turn it into pellets. Its material properties do not stand in the way of cascading use. However, the processing and use of wood needs to be adapted from a planning and conceptual standpoint so that multiple use becomes a reality." According to doctoral candidate Michael Risse, additional analyses in the context of cascading use are also essential. "For example, during the efficiency analysis, the scarcity of the individual primary natural resources should also be taken into account," he says. His published study does not take into account what is called the "substitution effect," which makes another weighty argument for cascading use: "The use of wood products helps to avoid greenhouse gas emissions that result during the production of non-wood products such as steel or concrete—and that applies equally for each additional cascading stage," Professor Richter explained. "Furthermore, wood is the only material that stores carbon throughout its entire life cycle." This way, the carbon bound during the growth of the tree is removed from the atmosphere and is only released again at the end of the cascade—which should last as long as possible. "However, theoretical analyses alone won't cut it. We need action from policymakers and the industry," Richter emphasized.